Rapid Prompting Method (R.P.M.) is a teaching technique which leads to communication for people with autism and other disorders affecting communication. Written choices and letter stencils are used initially, and then eventually the goal is independent hand writing and/or use of a keyboard. Education is a key part of everyone’s life. 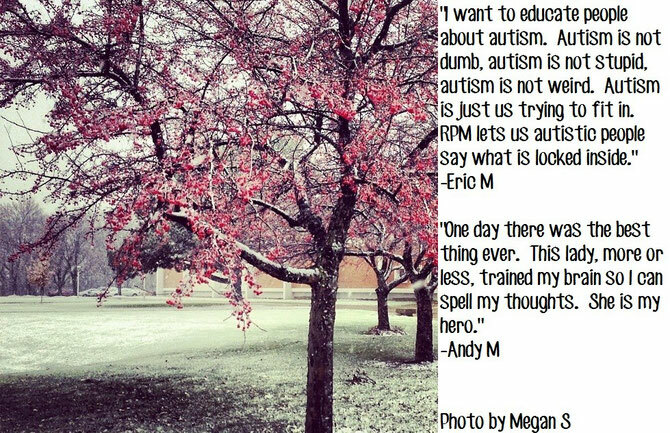 People with autism and other disabilities are able to learn and communicate. Every person communicates some way, as educators we need to find the method that works for each individual. Educators are responsible for giving students an appropriate mode of response through the open learning channel(s). RPM does that. It is a Teach-Ask approach in which the teacher gives information and checks for understanding by giving written choices and/or letter boards for response. RPM is amazing! Sometimes listening to someone is all the person needs. Let’s learn to use them wisely. Listening takes more effort for some people than speaking. Talking is what some people do all the time, yet say so little. We need to listen more and talk less. Listening shows people you are with you genuinely care. People need to know we love and care about them. Listening helps us know their needs. God wants us to be good listeners. Don’t rush and think you have to have all the answers. Just listen, be a good friend that listens. Be that kind of friend to your neighbors. I could only listen for years and now I can finally talk in a different way through RPM.